PYEONGCHANG, Gangwon Province -- Para Nordic skier Sin Eui-hyun will carry the South Korean national flag at the closing ceremony of the PyeongChang Winter Paralympic Games on Sunday. The local organizing committee unveiled the list of all flagbearers for the closing ceremony for the 12th Winter Paralympics, set to start at 8 p.m. Sunday at PyeongChang Olympic Stadium in PyeongChang, Gangwon Province. The list showed Sin as the flagbearer for host South Korea that will enter the stadium last among 47 nations. North Korea, which made its Winter Paralympics debut in PyeongChang, was not on the list as its delegation returned home Thursday. The flagbearer for the Neutral Paralympic Athletes from Russia was also missing. Russians are not allowed to compete under their national flag due to a doping scandal. Sin, who also served as the flagbearer at the opening ceremony, won two medals at the PyeongChang Paralympics. 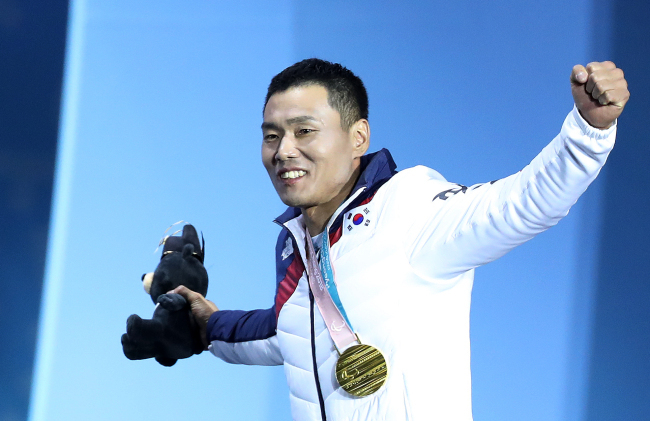 He became the first South Korean to claim a gold medal at the Winter Paralympics after finishing atop the men's 7.5-kilometer sitting cross-country skiing Saturday. Sin also won the bronze in the men's 15-kilometer sitting cross-country skiing last Sunday.